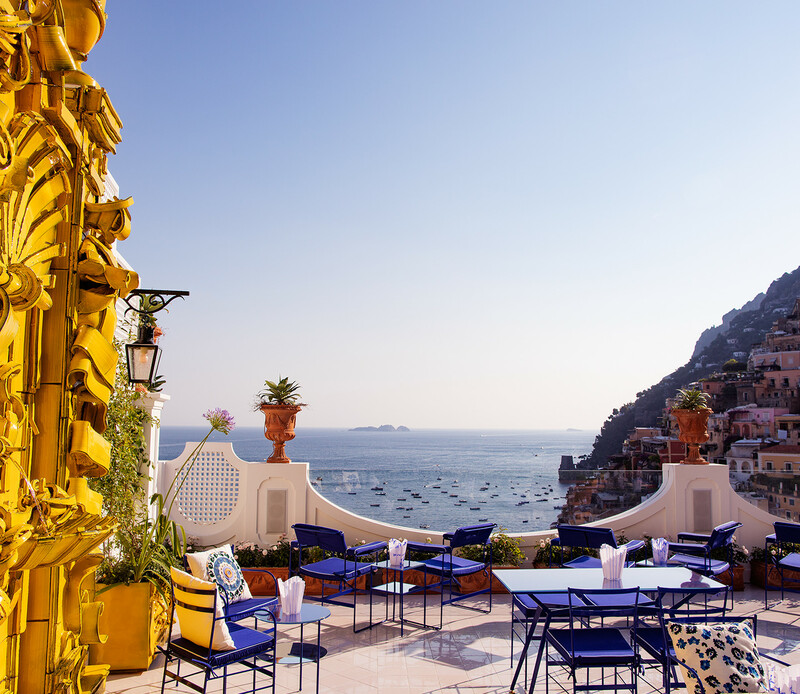 Positano’s newest watering hole is not just another seaside bar. An elegant raft suspended above the sea, vibrant with the colours of the Amalfi Coast, it represents, in design and details, a unique convergence of talented artists and craftsmen, assembled here to pay tribute to the man whose impeccable taste did so much to define the signature style of Le Sirenuse. The result is a contemporary al fresco bar with an old-fashioned, quality-first drinks menu; a place for amore, for friends, for a post-swim aperitif, for quiet contemplation of all that beauty. Remember back when bars were bars? When they had no need to double up as bistros, restaurants, or bookshops? Franco’s Bar harks back to that golden era. We serve no food except for some gourmet nibbles: salted almonds, giant green olives, and some rather more-ish potato chips. Food just distracts from that view – and the quality of the liquids list. Franco’s Bar pays homage to a golden age of fine spirits, cocktails and bubbly, when cultured imbibers knew their Old Fashioned from their French 75, and what kind of glass they should be served in. A striking neo-Baroque fountain that translates a fluid artist’s sketch into fragile permanence, the marker-pen gestures of a Dada-esque poet inspired by pop songs and other cultural echoes, a pair of lamps that resemble strange marine organisms, a beach-bar string curtain ennobled by its use of antique Venetian glass beads, a set of tables and chairs hand-painted by a Milanese designer in a quintessential shade of blue. These are just some of the details commissioned by Le Sirenuse’s owners, Antonio and Carla Sersale, for a bar that is also a collective work of art. Don Francesco Saverio dei Marchesi Sersale, to give him his full name, was one of four siblings who co-founded the hotel Le Sirenuse in 1951, in what had previously been the family home. A talented photographer, Franco was never happier than when travelling the world, from Peru to Mongolia. He travelled the world in Positano too, through the guests who over the years became firm friends, and through the antiques, artworks, textiles and ceramics with which he generously embellished Le Sirenuse. Franco’s Bar pays homage to his restless energy, his exquisite taste, his love of Positano’s cultured Mediterranean dolce vita.